I was really pleased to have get an invite to sail at Datchet Watersports 2 out of the last 3 weeks. A superb opportunity to join friends, old and new, and participate in some great dingy sailing. 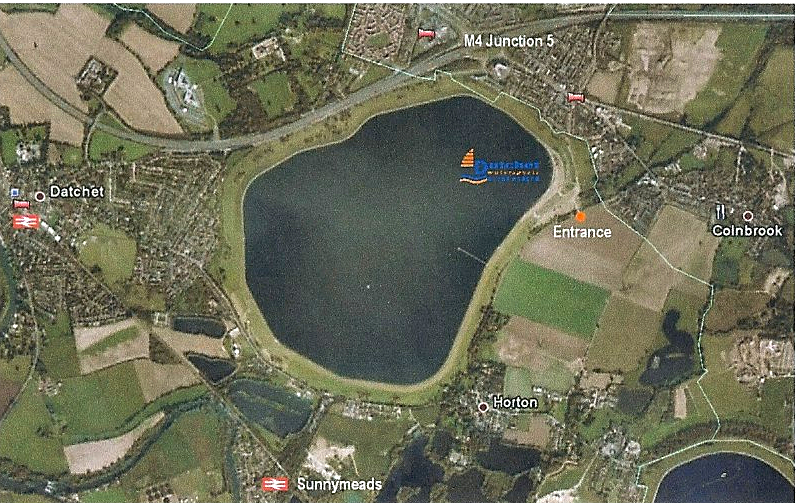 The Cub is located on the Eastern shore of the Queen Mother Reservoir just off junction 5 on the M4. As you look west across the water you get a magnificent, and less often seen, view of Windsor Castle. On my first visit, I arrived a little early and was made welcome by Dougal one of the centres many helpful staff. Here he is on the right welcoming and “protecting`’ the centres new supply of Windsurfing gear. Dougal – “Protecting” the Centres lastest equipment. The club boasts an excellent club house, with a bar, kitchen facilities producing excellent food and an upper viewing deck from where non-participants can get an excellent view of proceedings. The remainder of the crew join me shortly after arrival and my son George and I prepared for action! More than half the assembled group had not sailed before and, if I judged their expressions correctly, were somewhat apprehensive to say the least. Four of us had sufficient experience to ‘helm’ (drive) 4 boats and we split up and headed to the water. Unfortunately I didn’t have a waterproof camera with me, so here’s how it should have looked… Needless to say, we had a lot of fun, but were a little less professional looking! How it should have looked! We were out on the water for well over an hour, and the centre was more than generous when they came to tot up the bill – thanks guys. Here is a few of the intrepid sailors posing for photos after we came off the water. Charbel, Richard and Alice – Thanks to Richard for organising the event. Sailing with me was a new friend who was experiencing sailing for the first time. To say he was nervous was an understatement. I also had with my 9 year old son George, who had a lot to say on everything, and Alice Tapfield an associate member of the SailChecker team. George Showing how much he enjoyed the sailing. Chris Lait, as the CEO of SailChecker.com, is a regular blogger on the site He is also and the owner and founder of Drake Academy Sailing, a company delivering Leadership Development through sailing to corporates. Sailchecker are the only Yacht Charter company offering a comprehensive price comparison with free independent advice from industry professionals. They use the latest technology to compare all 6 major booking platforms. For more information on a Sailing Club near you, Yacht Charter or Sailing Courses, Flotillas and Holidays, simply visit www.sailchecker.com and fill out the simple form. Alternatively, email us at info@sailchecker.com.